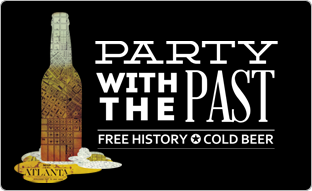 Here at FunAndFree we love Atlanta History Center’s Party With the Past Events. I mean, you get to drink cold beer, maybe a nosh….and you get to visit a great historic site and usually learn a little about art all at the same time. We’ve visited the Margaret Mitchell House, Westview Cemetery (way cool, btw),the Tabernacle and bunches of other great places. This June 18th they’ll be at The Wren’s Nest in West End. It’s the home of Joel Chandler Harris who created the characters Uncle Remus and Brer Rabbit. It all starts at 7;30 so drink a little, socialize a little and even learn a little! You’ll be glad you did. You can get more info at the AHC web site here. Previous Tunes from the Tombs is June 13th!